GST rates for restaurants has been a hot topic over the last few months. The government is of the opinion that restaurants have not passed on GST benefits to customers and have used GST to increase their profits. From the government's perspective they are correct. 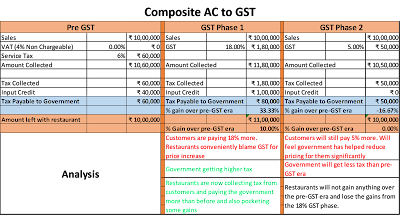 Restaurants (those who were earlier in the composite model - 80%+ of the industry I guess) have used GST as a way to charge customers more and have conveniently blamed the government for it. 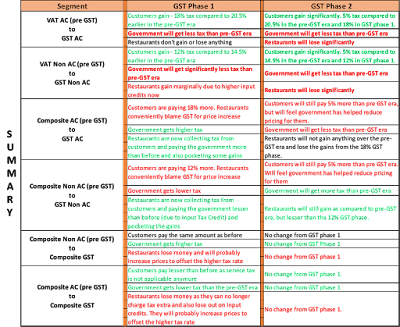 The alternate view on this is that most restaurants were waiting for GST before revising prices (which most restaurants do annually by about 5-10%) and have simply held off on raising prices because of the GST rollout. Thus in some ways by not increasing prices, the benefits have been passed on to the customers. In my opinion the real issue that irked the government was the fact that the restaurant industry by and large communicated to customers that the price increase is because of GST and they could do nothing about it. But the government's reaction to the situation is not something I agree with. Rolling back input credits is a reactionary populist move and is a big backward step, especially for this already cash heavy industry. By removing input credits, the government has shown immaturity and a poor understanding of the ground realities in the industry. The decision has been made without assessing the long-term implications. Or maybe the government wants things to function as before thus allowing a cash economy to thrive. Restaurants won’t complain, suppliers won’t complain, landlords won’t complain and now the consumers will also applaud the government that they have lowered costs for them (though they will actually be paying 5% more now than the pre-GST era). The decision creates a bigger problem in my opinion allowing the industry to once again gravitate towards cash collections and payments. Restaurants can show lesser sales and pay lower GST, pay off suppliers and landlords in cash without bills thus lowering costs. Landlords and suppliers are happy to do this as they don’t need to pay GST or can pay lower GST. 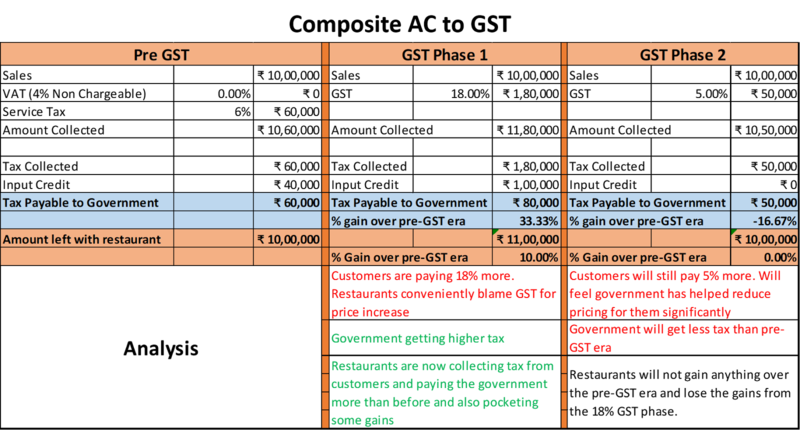 This also lowers their income tax pay-outs as they can show lesser income now. Landlords, suppliers and restaurateurs can play with cash again like before - Their good days are back. The government has in some ways just given them a 5% bonus to play with. 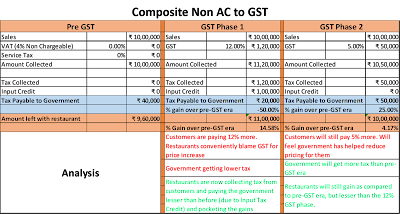 The GST rollout was a great opportunity for the government to push the fragmented restaurant industry and the supporting eco-system to move away from cash transactions, become more professional, tax compliant and gravitate towards digital payments. 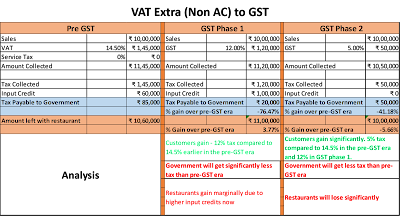 Lower Sales Reporting by restaurants (by conveniently siphoning off cash collections), thus resulting in lower GST and lower income taxes payable to the government. 1) Lower input costs: Suppliers are more than happy to offer products for cash (with no tax). For small suppliers, cash is a more convenient way of doing business and they don't need to bother about tax filings. It is also a way for them to compete better with larger/professional suppliers, who charge taxes. 2) Rental Payments: The biggest incentive to deal in cash is for landlords and they are very happy to take a large portion of their rental payments in cash. Cash payments are also a great way for them to reduce income taxes. They can also ask the restaurateurs to shell out more rent in lieu of the GST not charged to them (e.g. 18% GST gain split between the landlord and the restaurateur). 3) Staff Salaries: If restaurants officially employ more than 10 people, they need to register for ESI and when the number crosses 20, PF becomes mandatory. They also need to pay annual statutory bonus, leave wages and double salary for working on holidays (NFH - National Festivals & Holidays). Both ESI & PF, involve deductions from employee salaries and all of the above implies higher costs for the restaurateur. The largely migrant restaurant staff population does not value long term benefits nor are they keen on going to a ESI hospital. What matters to them largely is cash in hand. Having cash available to do this means restaurateurs can pay their staff more and avoid PF/ESI registration & the related expenses and compliance requirements. 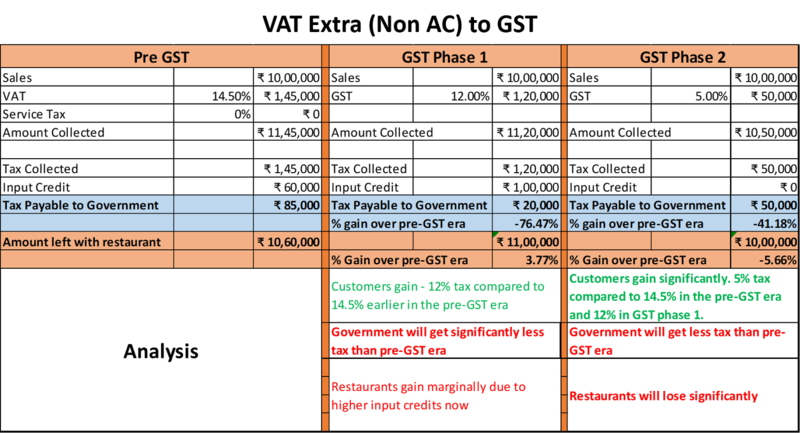 4) Paying lower GST and income taxes - Direct benefit of reporting lower sales. I believe this is not a primary motivator for restaurateurs and is simply an added benefit that comes with the solution to address the above 3 issues. 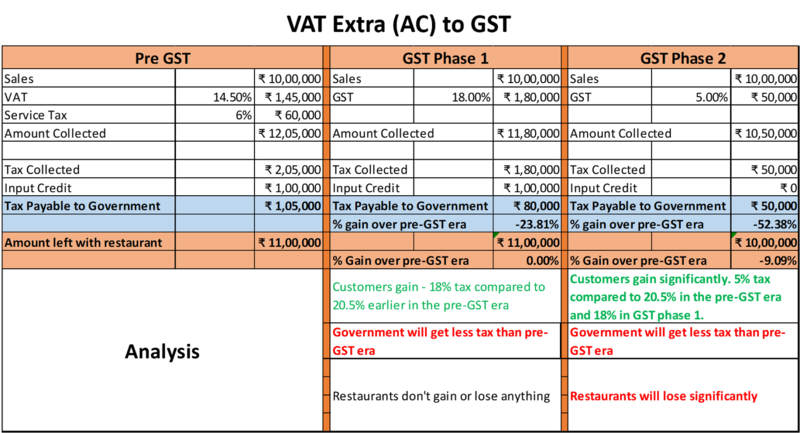 Issue number 3 above (Staff salaries) is not something GST could have directly addressed. 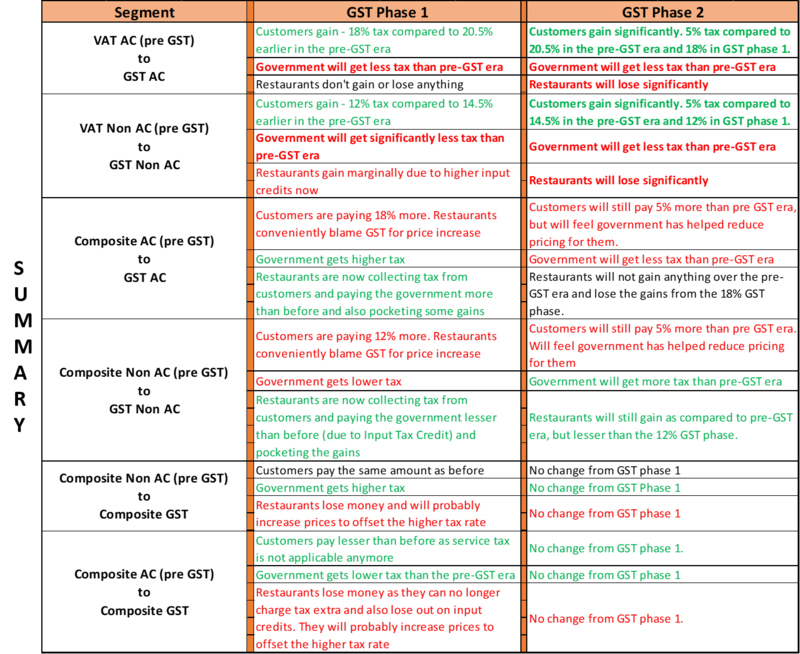 But GST could have truly helped with issue 1, 2 & indirectly 4. 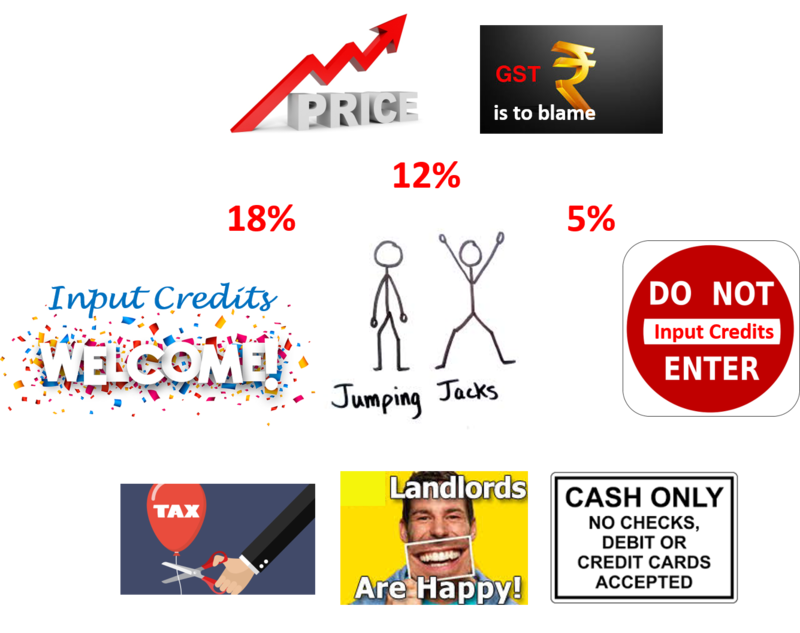 Allowing input credits may not altogether solve the problem of lower sales reporting by restaurants, but would have atleast pushed them to ask for proper bills from landlords and suppliers in order to avail input credit, thus addressing issue 1 & 2 above. Rental collections by landlords through banking channels would have a significant positive impact on GST collections as well as on income tax collections. Smaller suppliers would also slowly gravitate towards digital payments and proper tax payments. Because of the above, the restaurateur’s motivation to siphon off cash would reduce and this will mean higher GST and income tax collections for the government. 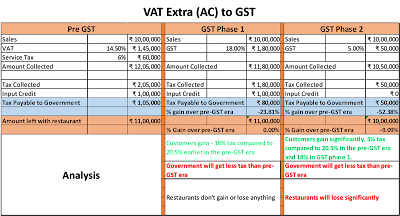 The government should have stayed with the GST framework, kept the GST rate at 12% for all restaurants (or stayed the course with 18%/12% rates as earlier) and allowed them to avail input credit. This would have ensured better collections and also helped clean up the supporting eco-system. Businesses would have been encouraged to move away from cash payments and gravitate more towards digital payments, deal with vendors who are professional and pay taxes honestly and also force landlords to show the real rentals they charge, pay GST & income taxes as per the rules. 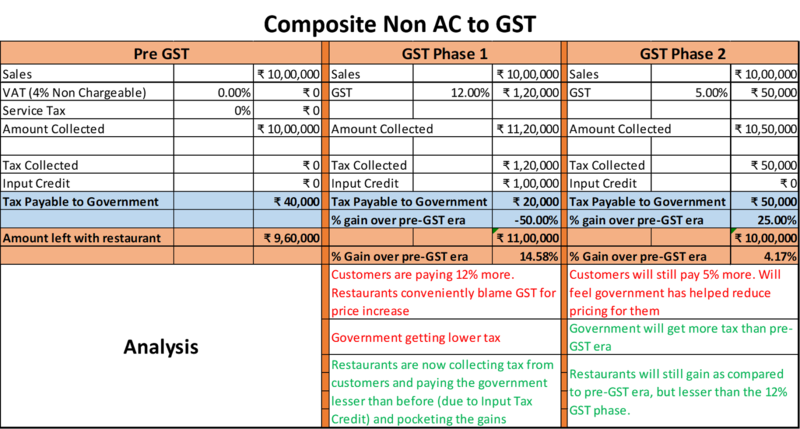 The GST regime with input tax credits would have slowly pushed the industry and the supporting eco-system towards becoming professional and paying taxes honestly. This would not have been a populist move though, but the long-term benefits would have been very impactful. As for consumers paying more, the government should have let market forces play their part. Why is the government trying to regulate whether a customer should pay Rs. 20.50 or Rs.22.40 for an Idly? Food is an essential need, eating out is not.